The Senate passed a version of HB 44 which has proposed measures that directly threaten our waters. The Bill, titled Local Government Regulatory Reform, includes Section 13 which guts the most cost-effective measures to addressing excess nutrients in our waters. The measure in question is protects streamside forests. As written, the subject bill allows their removal and replacement with grass. Streamside forests function to protect streambanks from erosion, filter pollutants from upstream sources, and improve both aquatic and terrestrial habitat. The water quality benefits have been well documented. A thorough synthesis published in 2007 of 45 studies found that wider streamside buffer (100 to 200 feet) were more effective and reliable than more narrow buffers. While buffers of 50 feet or less still have benefits they are a compromise between what is needed and what society was willing to accept. Thorough descriptions of the Bill along with quotes from scientific experts on its perils can be found in the Independent. The Smith Environment Blog has a post that also describes the key aspects of this unjustifiable Bill. What I’ll focus on is the cost effectiveness of these features for improving water quality. These critical features are some of the least costly and most beneficial for society. 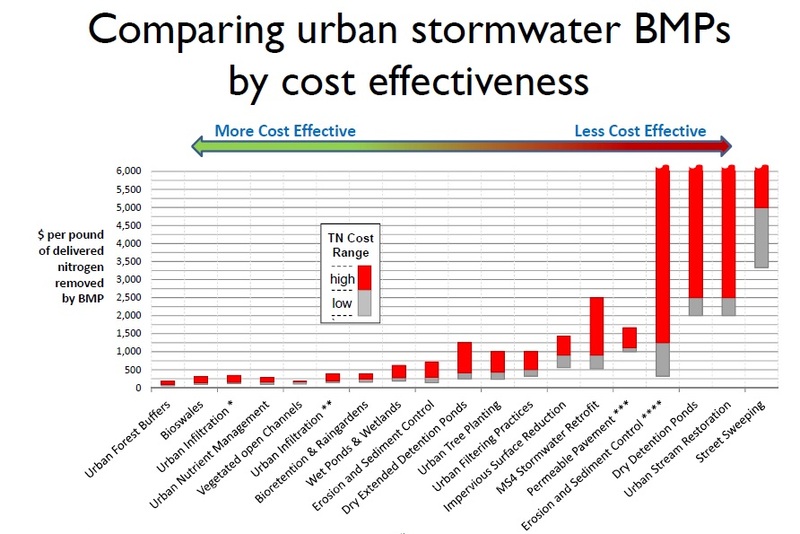 When compared with other measures, a State of Maryland study found forest buffers to have the best value when compared against other more costly stormwater control measures (see image at top). Removing their protections will result in negative impacts to water quality that are more costly to repair later. As written, HB 44 is bad for NC waters and needs to opposed.